The Tigers dominated the Tide in every way, crushing any "best ever" talk for Alabama and resetting the balance of power in college football. Clemson's freshman QB capped a remarkable season by leading the Tigers to the College Football Playoff title over Alabama. The Tigers throttle the Crimson Tide 44-16 behind 347 yards and three touchdowns from freshman quarterback Trevor Lawrence for their second title in three years. Clemson coach Dabo Swinney says the national champion Tigers are "as good of a program as there is out there, but we're a long way from a dynasty." 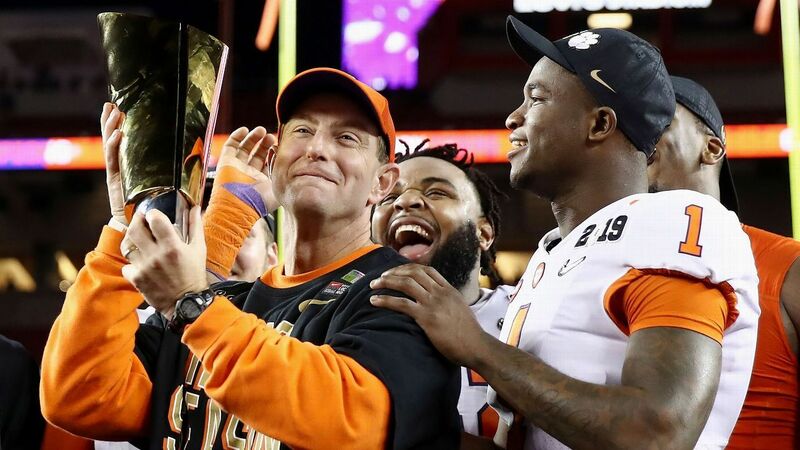 Ryan McGee examines the bold moves made by Clemson to build a dynasty that has resulted in two national titles over the past three seasons. Take a look at every Alabama game during the Nick Saban era to see just how dominant the Crimson Tide have been, and how thoroughly beaten they were on Monday night. ESPN takes a look at the five-year history of the CFP National Championship, with three featuring Clemson and Alabama. Those who can change the College Football Playoff format, the Power 5 commissioners, still think four is the right number, but recent discussions have at least opened them up to the possibility of change. Nick Saban said Alabama thought a busted third-quarter play that proved momentous in a 28-point loss to Clemson was a "really, really good fake, and somebody didn't block a guy they were supposed to block, and so it didn't work." True freshmen Trevor Lawrence and Justyn Ross team up for the dagger touchdown and plenty of highlight plays as the Tigers cruise to the national title. Clemson became the second 15-0 team in history by completely dismantling Alabama in the College Football Playoff National Championship Presented by AT&T. Tom Rinaldi details what could have been for Alabama and Nick Saban if the Crimson Tide had won the CFP national title. Chris Fowler and Kirk Herbstreit explain how Alabama settling for a field goal early in the 2nd quarter changed the complexion of the game. Nick Saban addresses the media after Alabama's loss to Clemson in the CFP National Championship, breaking down the Crimson Tide's mistakes. Rece Davis reflects on the future of Clemson football after the Tigers throttle the Crimson Tide 44-16 in the CFP National Championship. Tua Tagovailoa did not think Clemson did anything special to stop Alabama, but rather blames his decision making. Christian Wilkins ends his college career on a team that he claims to be the "best team ever." Clelin Ferrell and Christian Wilkins update Suge Knight's infamous speech at the 1995 Source Awards to appeal to Clemson recruits. Kirk Herbstreit gives high praise to Trevor Lawrence and the Clemson defense for their performances against Alabama. Justyn Ross shows off his ridiculous hands by hauling in two incredible, one-handed catches. Dabo Swinney raises the CFP National Championship trophy after Clemson's dominant performance. Trevor Lawrence says this journey has been unbelievable, and he hopes to win three more national championships. Dabo Swinney says it's a blessing for Clemson to be champions again and the first 15-0 team in college football history. The College Football Playoff National Championship is headed to New Orleans. Check out the complete 2019-20 CFP schedule. College Football Playoff National Championship weekend in the Bay Area is the place to be whether your favorite team is in the game or not. Learn about all of the events and festivities planned for CFP's Championship Campus. Imagine Dragons and Lil Wayne team up for the halftime performance during the 2019 College Football Playoff National Championship Presented By AT&T.